Sure enough, when J found out that she was taking this little beauty home, she began squealing and jumping up and down in delight. Anyway, this little event, while fun, sucked up most of our day today, which made me think: all this blogging is making me feel a little bit guilty. I see all of these events and I’m simply not taking advantage of nearly enough of them. Is it making any of you feel guilty? Do I need to balance this out with tales of my own maternal incompetence so that you won’t feel compelled to enrich your children’s lives each and every day? Or is it just my own neurotic desire to take on too much again? Should I seek therapy? Maybe I just ate too much cake. Uugh. . . marzipan roses. . . . Okay, just a reminder that if none of these fabulous activities call out to you, there are always the regularly scheduled events in our brand-new-but-surely-already-beloved What about TODAY? page. And just in case you think that now I’ve become complacent and am simply lounging on my couch eating marzipan roses, I’ve already made additions to the page. Because I’m all about bringing you some fun. The Guilderland Library will be handing out craft kids appropriate for kids 5-10 years old for them to make at home while supplies last. At 11 am, The Little Book House at Stuyvesant Plaza will be hosting Storytime with Candy Deisley. The Mont Pleasant Branch Library will have a Create a Collage program from 4-5 pm for kids in grades K-5. Registration is required, so check before you go. The CORE Church in Troy is hosting free knitting classes for kids from 3:45-5 pm. The Clifton Park-Halfmoon Library is having two story hours for 4-6-year-olds; choose 10:15 am or 1:15 pm. Evergreens are Always Green, preschool program at the Albany Pine Bush, runs from 10:30-11:30 am either Tuesday or Wednesday. Preregistration is required. Discover the Pine Bush is at 1 pm. $5/family. The Bethlehem Public Library is celebrating Groundhog Day at 1:30 pm for kids 3 and up. The Clifton Park-Halfmoon Library is having a Pajama Storytime with Dianne Payette for children 2-6. Choose 5:45 pm or 6:30 pm. There’s a 10 am Family Story Time at the Quaker Street branch library for ages 5 and under. At Moreau Lake State Park, there’s a hike from 10 am to noon where they’ll look for evidence of beavers, otters, and other water-lovin’ animals. The Clifton Park-Halfmoon Library has a 10:30 am storytime for 2-3-year-olds. They specifically say no siblings please. The Children’s Museum at Saratoga has a Cooking Around the World program for kids aged 3-6 years old from 11 am to 12 pm. You have to pre-register and pre-pay—check link for details. The Clifton Park-Halfmoon Library has a 1:15 pm storytime for 3-6-year-olds. At 10 am there’s an Under 3’s program of stories and fun for the 3 and under set at Rotterdam Branch Library. At 7 pm, the Bethlehem Public Library has Pajama-rama for kids aged 3 to 6. At 9:30 am, there are Preschool Movies at the Bethlehem Public Library. From 10 am to 11:30 am, there’s a Wiggle and Giggle program at the Children’s Museum at Saratoga. At 10:30 am there’s a Family Storytime at Scotia Branch Library for kids 5 and under. The Barnes & Noble at Colonie Center has a Welcome Sunshine! storytime at 11 am. Mmmm. 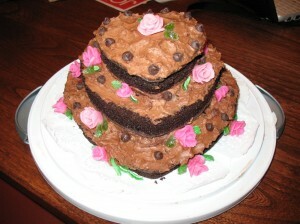 Sign me up for a triple layer chocolate cake with pink roses. You must be the best mom and dad EVER. PS: Did you see our girl Taylor with Stevie Nicks last night on the Grammys? She’s so so cool.